To a city slicker my house will be a veritable zoo. Maybe, a safari park is a better word to describe it. Someone living in a highrise apartment complex would probably see a few cats, dogs, and pigeons every now and then but if they visited what I call 'home', they'd call it a zoo! In and around my house living harmoniously together are a few cows & calves, four geese, four chickens, four dogs (our favourite, named Dizzy because he makes everyone dizzy! 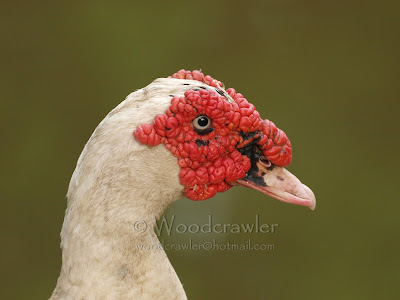 ), and one strange duck that i call 'punk' duck (for descriptive purposes). 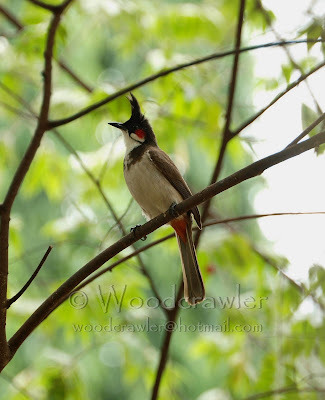 Besides these domestic creatures, living in my garden and yard are myriad birds; babblers, barbets, bulbuls, coucals, cuckoos, drongos, orioles, magpies, mynas, robins, sunbirds, flowerpeckers and even a lone shikra that comes for a soak daily. In the pond on my yard you can see a cormorant, brahminy kites, pond herons and kingfishers both big & small. Of course, the creepy crawlies are there too; garden lizards, ratsnakes & cobras with some small ones I don't even know the names of. Into this crowd landed Turner. On friday last, the 27th of March, my cook who was watering the garden called out, "Etta (elder brother), there is a baby squirrel lying dead here. Perhaps a crow got it." Thinking of giving it a decent burial, I went to inspect it. I saw a tiny creature, maybe a few day's old, curled up near a pot under my mango tree. As I picked it up, it was warm and I could feel it shiver involuntarily in my grasp. It was alive then. No ritualistic burial but a emergency resucitation was needed. 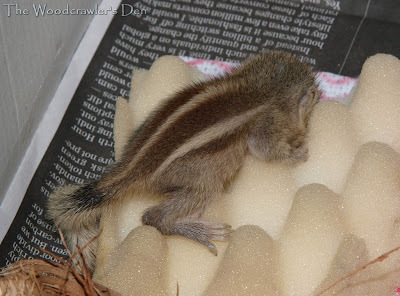 I came inside, picked up an old shoe box, lined it with a newspaper and put the tiny creature in it. After a minute it looked up groggily as if to ask "Where am I & who are you Oh! giant." I patted it in it's tiny head and reassured it, "You are in good hands for now", and went to tell my son about his new pet. My son was so thrilled and nearly squeezed the little creature in his excitement. 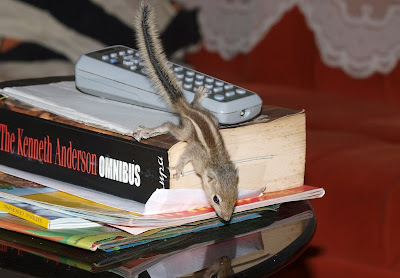 I rescued it before it was squashed like a toothpaste tube and told him to carry it in the shoebox. Over the next few hours we went through an elaborate excercise of naming the new inmate of our house. First it was Stripes, then Squeeky, the Riki Tiki Tavi and finally TURNER. Why Turner, I don't know, because it's the name of a tool that appears in Disney Cartoon, but it stuck. Turner is still very young. Drinks nothing but milk, half a cc at a time; and eats nothing. He drinks, sprays some urine and promptly falls asleep. We got a husked coconut pulled out some fibers mashed it into a soft mattress (coir foam?! )and put it one corner of Turner's home. My son has gone to visit his maternal granparents for his holidays. He left me explicit instructions to feed Turner, clean out his shoebox home and walk him! Walk him?! Turner doesn't walk. He hops, skips, jumps & runs. Mercifully he runs, not in the other direction but towards me. 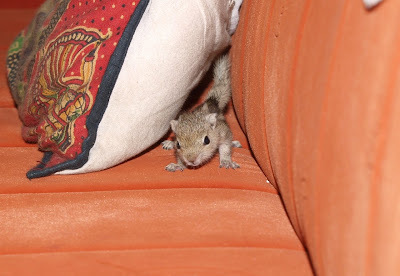 only problem is that he is so tiny that, when he plays hide and seek, I have to be careful I'm not sittting on him. He is so used to me, he thinks I'm his mom & dad rolled in one big giant creature. Every time I open his shoe box he stands up on his rear feet and reaches up with his fore feet, like a child asking to be carried. My little Turner.